Travellers have been exploring Asia for over a century now, but there is one Middle Eastern country that’s relatively new in the world of tourism; Jordan. Its popular image is more than just about deserts and camels as this breathtaking destination is full of beaches, ancient churches, mountains, castles, and much more. Although 85 per cent of the country is desert, its dramatic cliffs and red sands stem from the far south to the stony plains in the east. On the northern hills, The Jordan Valley can be seen running down to the Dead Sea. This sea is at the lowest point on earth and surrounded with canyons and mountains. On the southern part of the country, the beaches on the Red Sea with some of the world’s most amazing coral reefs can be discovered. Jordan has borders with a total of 5 countries, namely Israel, the West Bank, Saudi Arabia, Syria, Iraq and a sea border with Egypt on the Red Sea (Gulf of Aqaba). Geologically, 90% of Jordan is limestone, with the exception of Petra and Rum. Petra and the Rum Valley are made of sandstone, hence the reason they were easily carved into. The official name for Jordan is Hashemite Kingdom and it extends to around 90,000 square km; which is almost the same area as Portugal. Over 90 per cent of the 6.7 million population are Muslims. Life expectancy in Jordan is just over 74 for men and 73 for women. The final scenes from the movies Indiana Jones and the Last Crusade were shot in Petra City, a UNESCO World Heritage Site. Jordan’s GDP per-capita is just under US$6000. Its main economic sectors are tourism and phosphate production. The political system in Jordan is a constitutional monarchy of the Hashemite dynasty. The King is called Abdullah II, the son of King Hussein, who in 1994 enforced the conclusion of the peace treaty with Israel. The king is the Head of State, also Commander-in-Chief of the Armed Forces, who has the power to appoint the Prime Minister and the Council of Ministers. The Jordanian people love their king. In every house, hotel, or shop, a picture of their king is hung on the wall. They believe the peace they enjoy in their country is because of the king and a change in the monarchy would not be in their interest. This breathtaking desert is everything you would expect; extremely hot in summer and cold in the winter. Wadi Rum offers visitors several options for exploring its terrain. You can hire a 4x4 car with a guide and drive for three hours in the Wadi Rum desert to explore its sites. You can also do this on a camel - if you can dedicate half a day or so. 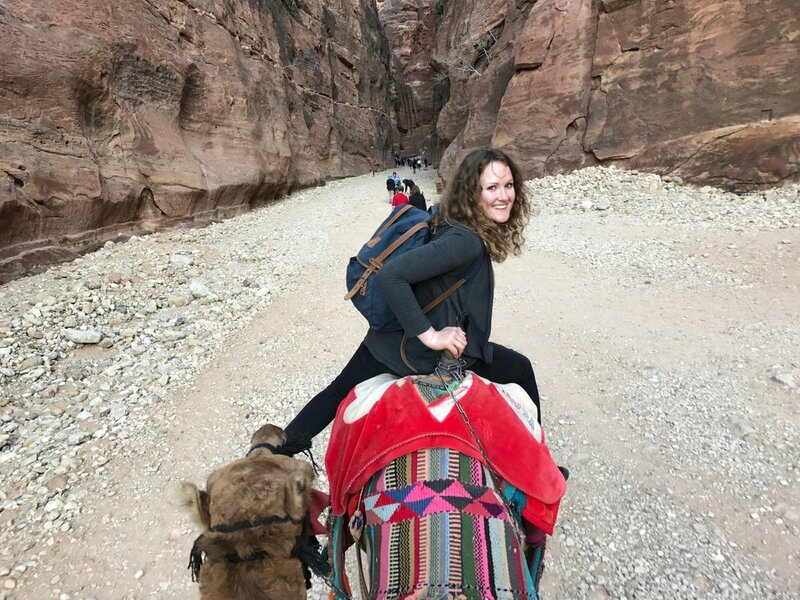 A camel ride will allow you to stay in one of Wadi Rum luxury camps in a Bedouin tent, where it is possible to enjoy an authentic meal followed by Arabic music. If you’re feeling adventurous, why not take a Wadi Rum hot air balloon ride to explore the desert site from up above. Flights take place in the morning and last for around 1 hour, with a maximum capacity of 8 passengers. You can buy your tickets directly from the Wadi Rum Bedouin camp or contact Rum Balloon via Facebook. 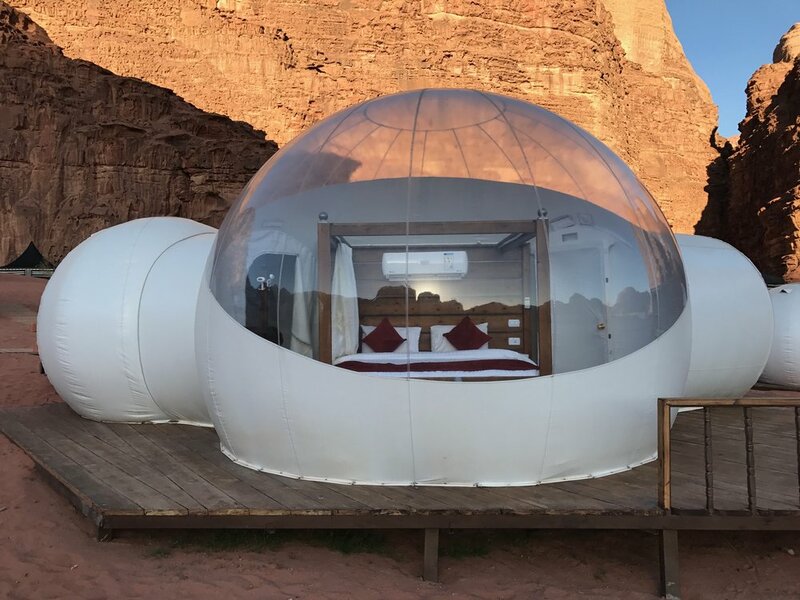 The unique tents at the Wadi Rum Night Luxury Camp offer the most stunning views of the stars at night, where you can smoke shisha or drink a cup of tea in front of an open fire in the relaxation area. Each tent is equipped with a Bedouin bed, a private terrace, Arabian furniture, shower and toilet, and a choice between twin, single, double, triple, and Full of Stars tents. You can also enjoy a 5-star buffet dinner at the camp’s restaurant. There are various activities that you can book including an excursion through the protected area of Wadi Rum. These include camel rides, jeep adventure rides, balloon rides, sand boarding, 4x4 driving experience, and Nomad visit. The Dead Sea stretches across Israel and all the way to the Jordanian border. The salt content of the Dead Sea is six times more than a normal ocean, hence the reason it is impossible to swim or drown in. What’s more, there are no seaweed, underwater plants, or fish in or around the water. With such high mineral salt content, it is no wonder that species aren't able to survive in this sea. However, it is the only sea that allows you to float in whilst reading a book. Tip: Visit our blog article about Israel, where we gathered a lot of tips and recommendations about swimming in the Dead Sea. No holidays in Jordan are complete without a tour of the Rose City, Petra. Nestled in a tranquil and secluded valley, Petra was once part of the Nabataean empire. It was, however, left deserted for hundreds of years before being rediscovered around 300 years ago. The lost city of Petra is now one of Jordan’s top tourist attractions. Petra is famous for its rock-carved architecture and considered one of the wonders of the world. It is located 120 km north of Aqaba and 24 km south of Amman, the capital city. If you want to enjoy your Petra holidays even more, pay a visit to Petra Night Show. This magical event is a great way of seeing the rock city by candlelight, with over 2,000 lit candles. This event is organised three nights a week, on Mondays, Wednesdays, and Thursdays. Petra by Night starts at 8.30 pm from the Tourist Information Centre and lasts for around two hours. Your tour begins with walking through the small canyon all the way to the Treasury, where over 1,000 candles are lit in order to bring the breathtaking views to life. Your evening won't be complete until you take a stroll down to the tranquil Siq and take in the spectacular sights. Once you reach Al Khaneh, you'll be asked to take a seat and listen to the authentic Jordanian music played by the locals. The entrance fee for this event is 17 JD, children under the age of 10 can enter free of charge. You can buy your tickets from Petra's Visitor Centre or at your hotel reception. Located on the edge of the Red Sea, the tourist resort of Aqaba is well-known for its sandy beaches, vibrant reefs, and clear waters. Holidaying in Aqaba goes hand in hand with diving, snorkelling, parasailing, fishing, and of course; plenty of sunshine. This holiday destination in Jordan boasts sites that date back to 4,000 BC, with the world’s most ancient church dating from the third century AD. If you are staying in the capital, you can catch a flight on the Royal Jordanian, which takes approximately 1 hour and costs 37 JD one way. There are two daily flights, one in the morning and one at night. There is also the King Hussein International Airport located 20 minutes away from Aqaba. The Red Sea has particularly calm waters and enjoys high temperatures throughout the year. Unlike the Dead Sea, there is a wealth of marine life present with over 200 coral species. Visitors can go snorkelling in the Red Sea all year round as the water temperature remains at around 25 degrees Celsius. 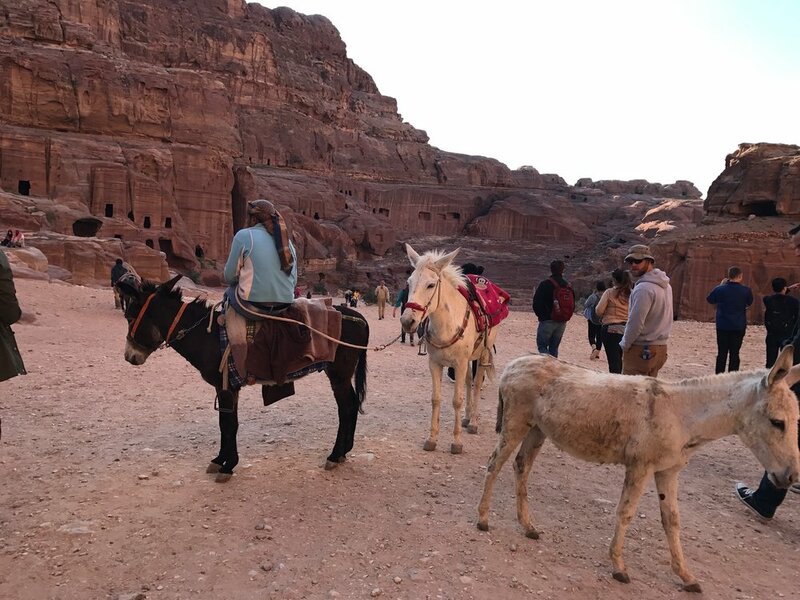 During a visit to Petra there are offers for horse-drawn carriages, donkey or camel riding. People are very pushy to sell their offers to you and expect a definite and clear answer : yes / no, thank you. No uncertain replies like maybe, later, don't know. They won't let go until they get a yes out of you forcefully. "It's a beautiful day. I prefer to walk," is a good excuse to say no. They are nice people, but they want to make money out of you! The main international airport in Jordan is Queen Alia International Airport. It is close to Amman, the capital city and also a major transport hub in the country. The other airport is called King Hussain International Airport, which is located in Aqaba. There are many airline operators that offer direct flights from Istanbul, London, Frankfurt, Paris, and Rome to Jordan. Which Airport is best if you want to visit Petra and Wadi Rum? King Hussein Intl. Airport is approx. 110 km from Petra so it will take 1.5 hours to drive there. The closest town to Petra is Wadi Rum, which can be reached by driving through the desert highway from the capital city. It will take 3.5 hours. If you don't wish to drive, there is one bus per day from Petra to Wadi Rum that leaves early in the morning. This trip will take around 2 hours and you can book tickets at your hotel and get collected from there in the morning. When traveling to Petra and Wadi Rum, would it be better to come from the Israeli side or Egypt? When you are taking a tour of Petra and Wadi Rum, you can save money on flights if you choose a budget airline and fly into Tel Aviv, Israel. The town of Eilat in the south of Israel is also the closest place to Wadi Rum and Petra. However, this depends on how much time you have available and where you want to cross from. There are only 3 main entries into Jordan so it would be easier to come to Petra and Wadi Rum from Israel. EU and British citizens don’t need to apply for a visa before they visit Jordan as they’ll be issued with a visa upon arrival at the border or airport. This visa is valid for up to one month and costs around 20 JD. For multi-entry visas, you must apply at the Jordanian consulate or embassy in your country before your trip. Jordan is without doubt one of the safest and most peaceful countries in the Middle East - and the world! The moment you arrive in the capital, you will experience the Jordanians' warm and welcoming attitude. Jordan has maintained a good relationship with all of its neighbouring countries and is considered an oasis of peace. You will definitely feel instantly at home there. Why go on holidays in Jordan? Jordan has a wealth of natural and historical sites that attract millions of tourists every year. The city of Petra is a UNESCO World Heritage Site, thanks to its rock-carved architecture. There are lots of tombs that have been left untouched, with the famous Treasury being the best known monument. Jerash is another worthwhile city to visit and offers the world's best preserved Roman ruins. Visitors can enjoy this city's beautiful theatres, plazas, and many historical monuments. Aside from Jordan's impressive history, it is home to some unique natural sites and rock formations that have been created by the power of sand and wind. This Middle Eastern country certainly has a lot to offer tourists and is a must-see destination. The best seasons to travel to Jordan are in the spring and autumn. The months of April, May in spring and September, October, and early November in autumn are the most popular as it hardly rains and temperatures are mild. If you can tolerate higher temperatures, then you might want to travel there in June. This is the best time of the year for trekking. The capital city, Amman, can surprisingly be cold in winter time, with some snow on the mountains. 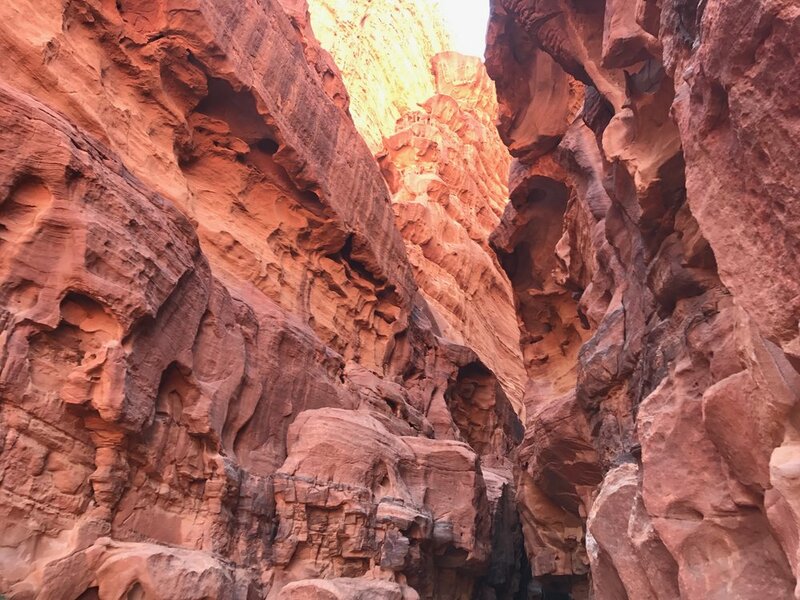 Aqaba and Wadi Rum can be very hot and humid in the summer months, especially in the Jordan Valley so if you can't withstand the heat, it is best to avoid travelling there during July and August. How far is it to drive to Wadi Rum and other cities in Jordan? Since 2003, Jordan has been home to over 2 million Syrian refugees, and over 1.7 million Iraqi refugees plus those from the West Bank, a few thousand refugees from Yemen, Libya, and other smaller countries. The Jordanian people, by and large, treat these refugees like their own brothers and help them out. A Bedouin, for example, told us that these refugees arrive here as Syrians, Iraqis or Arabs from the West Bank, but in ten years' time, the next generation will be Jordanians. For these refugees, integration is much easier compared to Europe, because they share the same background, religion and beliefs. This shows the strength of the Jordanian community that lets people who have fled to Jordan become Jordanians and part of the integrated community. Above all, the challenge that needs to be overcome is the development of infrastructure such as schools, roads and clinics, which are needed every time a new wave of refugees arrives from a neighbouring country. The challenge is meeting all the costs, plus providing enough water and electricity to make them available for everyone. Jordan gets a lot of international help, but because of corruption, the money does not go where it is needed most. In the past, Bedouin weddings were arranged, but today this tradition is fading away. It wasn't so much the case of the newlyweds meeting each other for the first time at the wedding, but rather they had already seen each other 1-2 times, perhaps flirted with each other or kissed in secret. the man asked his parents for the woman's hand from her parents. Bedouin weddings are lavishly celebrated and it is not unusual to spend up to $200,000. But this expense doesn't have to be covered by the family alone - rather it is a custom that each guest gives up to $30-50 to the newlyweds. These arranged marriages tend to last for life, much longer than love marriages. Another custom is when a Bedouin asks for help. The person offering the help has two options, on the one hand, he can offer help to the seeker without expecting anything in return, no matter what his needs are. For example, if the help seeker needs 200 camels, then 200 camels must be given. But it is also a question of making the effort to find 200 camels. The seeker is likely to accept only some of the camels, but will very much appreciate the willingness and help. If he says no and doesn't accept the camels, he would come across as unfriendly and leave a bad reputation for himself. If a Bedouin visits the home of another Bedouin, the host will not ask questions about the purpose of the visit for three days and show his hospitality. However, on the fourth day, the host is allowed to ask the guest his name and the purpose of his visit. The "visitor", however, is not obligated to answer, he can either pray for help and explain his visit or leave the house without saying a word. It is a custom to offer hospitality and help to guests so the homeowner cannot refuse these visits. Jordan is 2 hours ahead of Greenwich Mean time and 1 hour ahead of Germany. Its daylight savings time starts from 30th April to 30th October. 2. Is there a strict dress code in Jordan? Keep in mind that Jordan is a Muslim country so it’s preferable for women to avoid wearing short skirts. Although Jordan isn’t a very conservative Middle Eastern country, you will feel more relaxed, especially in the capital city, if you wear comfortable clothes that aren’t too revealing. No, but it is expected of you. If you were happy with the taxi driver’s service, or the guide who showed you around town, you can show your appreciation by tipping. In restaurants, a service charge is added to your bill, but if not, you should leave a tip. 4. Where is Jordan located on the world map? Jordan is an Arab state located in western Asia, on the Jordan River’s East Bank. It is strategically situated at Africa, Asia, and Europe’s crossroads. The capital city, Amman, is the most populous city and the political and cultural centre of the country. 5. Why shouldn't I drink the tap water? Due to the dry and hot climate in Jordan, visitors are at risk of heat exhaustion. Most hotels use water filtering systems, however, there is still a slight percentage of chlorine in the water. It is best to buy bottled water as the tap water tastes rather salty and unpleasant. 6. What’s Jordan’s official currency? Jordanian Dinar is divided into 100 piasters. 1 JD is equivalent to 1 euro 14 cents. 7. Are the tourist attractions in Jordan’s cities available all year round? Most of the tourist attractions are open all year round, unless there are official holidays. You must check the dates and opening hours of each attraction before planning your Jordan trip. 8. How long is the single entry visa into Jordan valid for? It is valid for one month, but it can easily be extended for an extra fee at any police station. 9. Which borders in Jordan provide visa upon arrival? At Queen Alia Airport and Sheikh Hussein Bridge, you can obtain visa upon arrival, depending on your country of origin. So if you have a European passport, for example, you can pay a visa fee at the border and stay for a maximum of 1 month. 10. Will I need certain vaccinations for this trip? You won’t need any special vaccinations for Jordan. However, we recommend that you vaccinate against measles, hepatitis A and B, and mumps. 11. Do the locals speak English? Some locals do speak English, especially near tourist attractions and Jordanian children who learn English at school. Your guide can help you learn a few phrases in Arabic or you may take a phrasebook with you. 12. What's the food like? It’s a typical Mediterranean-style cuisine with a variety of textures and spices. Hummus, tabbouleh, pita bread, and spicy chicken are some of the examples. 13. Is Jordan a suitable destination for families with small children? Definitely! Jordanians love children and are very much family oriented. Most of their school-aged children can communicate in English and are more than willing to practice with your family. 14. Is Internet access and mobile phone coverage any good? Internet isn't quit so readily accessible everywhere, but there is good mobile phone coverage in all the cities. Most hotels offer Wi-Fi connection and you can also find Internet cafes in major towns. Before traveling to Jordan, it is advisable to have comprehensive travel insurance in case you require medical assistance or your flight gets cancelled. While it's not compulsory to take out a policy, we certainly recommend that you do.